Minnesota has a reputation for mild manners (and flavors), but you’d be surprised at just how many great international restaurants the Twin Cities have to offer. From Japan to Somalia, Thailand to Mexico – here are the best international restaurants in Minneapolis and St Paul. Thai Garden is a relatively new, family-run spot that’s sourcing hard-to-find ingredients and serving up funky, fresh and awesomely delicious Thai food. The menu is varied and the owners, in typical Minnesota-fashion, are super friendly – asking them for recommendations will undoubtedly lead to an easy conversation, and the food you’ll order thereafter will be the best on the menu. In the Cedar Riverside neighborhood of Minneapolis, sometimes referred to as Little Mogadishu for its high population of Somali immigrants, there are a handful of Somali restaurants to choose from - but West Bank Restaurant is the top of the heap. It’s not a place you would normally read about online, but that doesn’t make it any less legitimate. Walking in, it’s likely between 8 and 15 men will be staring in your direction as they eat, drink Somali tea, and watch the news or a soccer game on the big screen to the right of the entrance. But don’t mind them and head to the back and order the chicken suqaar – a spicy chicken dish served with rice, onions, peppers, a side of Somali hot sauce and an unpeeled banana. As you inhale the chicken and rice, don’t forget to put that spicy green hot sauce to good use, calming your mouth with small bites of the banana throughout the meal. While tiny, unassuming, and one of many Vietnamese restaurants lining University Avenue in St Paul, Trieu Chau is a spot whose food and service stand out. The frothy bowls of pho are nearly overflowing with rich, slightly sweet beef broth and toothsome rice noodles. The rare lean beef is tender and needs hardly a few seconds in the steaming broth to be perfectly cooked, but there’s no need to play it safe here – experiment with expertly prepared tripe, tendon and a variety of other meat and seafood fixings for your pho. Other items on your Trieu Chau checklist should be the bun thap cam (BBQ pork, pork meatballs and pork eggrolls with rice noodles), spicy bun bo hue (well-balanced soup with thick rice noodles) and mi hoanh thanh (pork and shrimp wonton soup with thin egg noodles and sliced BBQ pork). Since opening its doors in 1954, this deli in Northeast Minneapolis has been cranking out fantastic smoked sausages, fresh breads and pastries, and a variety of traditional Eastern European comfort foods. The cabbage rolls are divine – a tender, mild leaf of cooked cabbage lovingly wrapped around a savory mixture of beef, pork and rice, and topped with a tangy tomato cream sauce. The sausage ‘sandwiches’ are another great choice, served on house-baked bread with a healthy helping of sauerkraut. 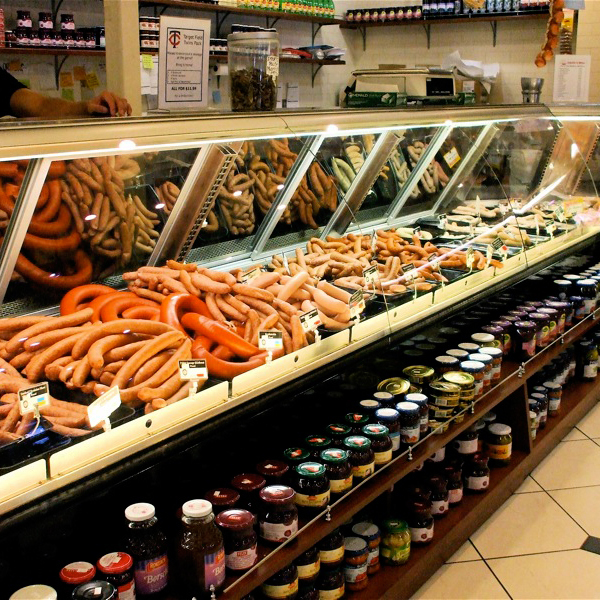 Pro-tip: connected to the restaurant is the fresh meat deli counter and a market with European imported goods ranging from Polish pickles to German cookies that are hard, if not impossible, to find elsewhere in the Twin Cities. One of the only spots in the Twin Cities serving Cambodian food, Cheng Heng is a tiny, no-nonsense restaurant that remains a hidden gem, undiscovered by many. The chive cakes are an excellent start to your meal – vibrant chives tucked inside of a rice wrapper are pan-fried, creating a crisp texture on the outside and letting the inside remain perfectly glutinous. If spicy soups are your thing, order a bowl of the kor koo – a red hot soup with flat rice noodles and hunks of beef. End your visit with a couple of glossy Cambodian donuts for the road. We’re still working our way through the menu – but have yet to be disappointed. Generous portions and affordable prices are just the cherries on top at Filfillah, where the main attraction is the food. From succulent shawarma to grilled kebabs, house-baked Turkish bread to fresh, sticky sweet baklava – Filfillah isn’t the prettiest of places, but it serves quality food, every time. The Filfillah platter includes all of the shawarma and kebab you could want along with a simple salad, fresh Turkish bread, and rice. Add a side of smooth hummus and light, crisp falafel – and you’ve got a meal big enough to satisfy two. Gorkha Palace in Northeast Minneapolis specializes in classic Nepalese, Indian and Tibetan dishes. From pakora to momo, curry to thenthuk, you can stick with what’s comfortable or try something new. Start with the buff momo – steamed Himalayan dumplings stuffed with grass-fed bison, scallions, onion, ginger, garlic, cabbage and spices served with tangy tomato chutney. The Nepali lamb choyla – skewered lamb with spices cooked in the tandoor and served with a thick lentil soup, Nepali potato salad, rice and tomato chutney – is delicious and well rounded. The epitome of a hole in the wall, Korea Restaurant is a small, slightly run-down looking spot in the Stadium Village neighborhood of Minneapolis where University of Minnesota students are plentiful. Order from the counter and grab a seat – the place is busy during lunch, so there may be a short wait. The bulgogi (whether pork, beef or chicken) is popular for good reason and comes with a smattering of traditional banchan (sides), from kimchi to stir fried spinach to bean sprouts with broth. If you like funk and spice, the kimchi soup is a great option to clear out the sinuses and fill your belly. A Northeast neighborhood favorite, El Taco Riendo is a counter-service restaurant where you can feast on all the classic, casual Mexican dishes. Tacos wrapped in a duo of hot corn tortillas, chimichangas fried to golden brown perfection, huge tortas with layers of meat and cheese, creamy chicken or pork tamales, heavy and satisfying sopes, even meat-filled empanadas. The tacos come loaded up with as much meat as they can handle, a sprinkle of raw onion and cilantro and sliced radish, lime, and salsa on the side. While beef tongue and tripe are available and quite popular, many stick with pork al pastor, carne asada or chicken tinga – so, we recommend you try one of each for a choose-your-own taco sampler. If you’re feeling the hunger of four or five people, order the torta cubana – a sandwich of epic proportions with split and griddled hot dogs, ham, steak, lettuce, cheese, jalapeños, potatoes, onion, and tomato.